atom’s online payment gateway platform offers you various solutions for processing transactions. Our Payment Gateway is integrated with 50+ banks and 256+ payment options offering transaction through all major Credit Cards, Debit Cards, IMPS etc. Its robust set of capabilities is devised to aid both start-ups and the longest running businesses to grow revenue, alleviate risk and safeguard customer’s data. Our bulletproof online security backed with PCI DSS version 3.2 and 256-bit encryption ensures safe transaction. Your customers can pay through numerous payments options like 10+ Credit Cards, 45+ Net Banking, 100+ Debit Cards, Bharat QR, 10+ wallets, IMPS, ATM Cards with Pin, Challan, UPI, NEFT/RTGS. atom’s bulletproof online security backed with PCI DSS version 3.2 and 256-bit encryption ensures safe transaction. Express checkout allows registered customers to securely store the card number and expiry date so as to avoid entering the same for every transaction. Through this facility customer will be able to complete the subsequent transactions by selecting the saved card and entering the CVV number. In the event of transaction failure due to reasons such as time out or connectivity issues, customers are usually required to re-enter all the transaction and instrument details making it a cumbersome process. Paynetz’s retry option is a feature where the customer is given the option to retry instead of filing the details all over again. A customize page will be sent along with payment link to customer on his/her registered email id. Customer can complete the payment and will receive payment confirmation on his/her email. Merchant can run mass mailer campaign to his customers with certain attractive scheme along with payment. We provide multiple gateways to merchants to ensure uninterrupted transaction flow i.e. if any of the gateway is not functioning because of bank server, the transaction will automatically route to an active gateway. Standing Instruction (SI) is a service by which the merchant can pull money from the credit card on periodic basis. This module works well for industries where there is recurring payment collection e.g., Utility, Insurance etc. 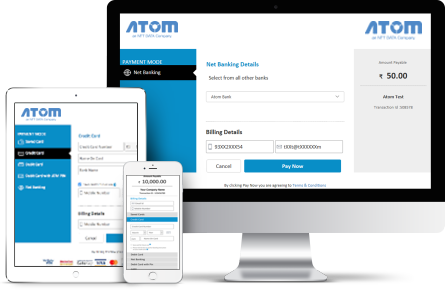 atom provides multi bank credit card EMI which gives your customer the ease of payment in instalments and also empowers merchants to sell higher value products. It is available across 10+ credit cards and is the ultimate mid-way to balance your customers budget. Accept payments from all major credit and debit card networks like Visa, MasterCard, American Express and RuPay. Banks including SBI, ICICI Bank, HDFC Bank, Axis Bank, Kotak Bank, Yes Bank etc. can be used for online transactions. The bank page opens in a pop-up window so your customers can easily come back to your website. Unified Payment Interface is system that powers multiple bank accounts into a single application, merging several bank features, seamless fund routing and merchant payments into one hood. Challan is a payment mode to make online transactions and then paying for it offline at a branch. Customer can make payment at any Bank Branch pan India saving time and money. This electronic fund transfer system allows the money sent by the remitter to immediately reach the payee/beneficiary as and when the money transfer transaction is initiated. ePayLater option offers short term credit to buy product/services hassle free. The buyer can pay for the product/services purchased at later period as per convenience. atom provides multi bank credit card EMI which gives your customer the ease of payment in instalments and also empowers merchants to sell higher value products. Customers simply need to scan the QR code and enter the transaction amount. The amount gets transferred directly from the customer’s bank account to the merchant’s bank account. Paynetz gives your customers freedom to pay with their favorite digital wallet. Atom gives you 10+ wallet options. Using Google Pay, users can also send or receive payments instantly to anyone nearby without needing to share personal details, like bank account information or even phone numbers. Easy to use, link based payments allow merchants to request payments by generating and sending payment links to their customers over WhatsApp or SMS. atom technologies offer easy to use payment gateway integration kits for website & mobile app for more than 25 platforms. Our APIs are simple with detailed documentation along with dedicated technical support. No coding expertise required for integration and payment page is optimized for both desktop & mobile. atom provides a Merchant Admin Console which helps the merchant to monitor transaction online on real time basis. With customizable design and layout, you can access the console anytime, anywhere. Our intelligent tools help you boost conversions and capture more revenue. Manage your transactions, refunds, disputes and settlements from one single dashboard. Customer purchases a product from your website. They can press the ‘Pay Now’ button which will redirect them to online payment gateway. Following verification and authorization, payment gateway notifies you that the payment has been approved and you can deliver the ordered products or services. Our bulletproof online security backed with PCI DSS version 3.2 and 256-bit encryption ensures safe and reliable transaction. The amount is easily deducted from the customer’s account and credited to the merchants account in two working days. atom’s multi-currency processing system enables merchants to give their customers a localized buying experience with 265+ payment options including Rupay, Amex etc. Easy to use payment gateway integration kits for website & mobile app for more than 25 platforms. atom provides quick on boarding, 24*7 support, easy API integration and EMI for customers. Its agility and finesse enables every business to flourish impeccably. How is atom different than other payment gateways? atom provides numerous options to its merchants. Be it online payment gateway or POS machine. It is one-stop solution for all payment related services. Our payment gateway provides 265+ payments options as well as EMI to sell higher value products. How can I start using atom online payment gateway? Sign up with atom tech and fill in the details. One of our customer care executives will soon get in touch with you.